The acrobatic arts have a long and illustrious history. It was from the art of acrobatics that the art of Aerialism and other Cirque Performance later came into being. According to The New World Encyclopedia, the word “acrobatics” comes from the two Greek words “Acros” and “Bat” which translated mean high walking. Minoan culture featured depictions of acrobats in art and murals from as early as 2000 BC. Some of the acrobats performed on the backs of running bulls. Egyptian murals and Greek vases also depicted acrobatic feats. Many of the performances of ancient times were a part of religious rituals and religious festivals, such as the village harvest festival. The earliest acrobatic troupes performing in China were documented almost 2,500 years ago, and by the time of the Han Dynasty, the acrobatic arts had spread wide and far, and many varied types of acrobatic performances were prevalent. Performances such as Rope Walking, Pole Climbing, and Five Tables were accompanied with music and performed all over China. The Dunhuang mural painting entitled “Lady Song Going on a Journey” which was painted during the Tang Dynasty, shows images of acrobatic feats being performed. The earliest acrobatic troupes were simple people, and they incorporated objects from their daily life into their performances; tables, chairs, ladders, jars, plates and bowls, to name a few. This trend is still in evidence in three ring circuses. 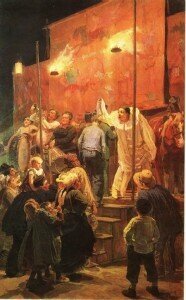 The beginnings of the modern Circus, or Cirque, can be traced back to Roman times. Originally a circus was a large building for the purpose of exhibition. Most often the exhibitions consisted of chariot and horse races, equestrian shows, jugglers, and, of course, acrobats. The Circus building had tiers of seats running parallel on either side of the course, curving at the ends to form a crescent at either end. 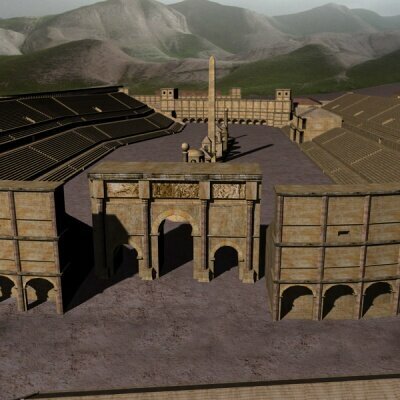 The most famous circus of Roman times was the Circus Maximus in Rome. 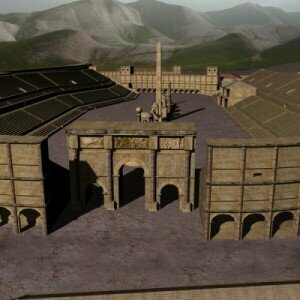 Originally built of wood, it eventually grew and was rebuilt into a stone arena that could seat 250,000 people. Around that time troupes began to roam in wagons and perform their acrobatic feats in towns and cities across the later Roman Empire, made possible by the Roman roads and the relative peace of the Roman Empire. This continued into the Middle Ages and other types of performance, such as juggling, singing, trained animal acts, and theatrical dramas were added to the mix. Traditionally the acrobatic skills of the troupes were a family affair, and most travelling troupes were family-centric. Skills were passed from parent to child, a tradition still existing today in some troupes. But it wasn’t until the late 18th Century that the modern Three Ring Circus evolved. Philip Astley was the first circus owner to introduce a ring into the circus tent, though he called it a Circle. It was created so that the trick equestrian acts could perform in a circle. The diameter of today’s circus ring stands at 42 feet, which was the size needed for a horse to comfortably circle while going at a full gallop. The circuses of this time period were most often held in large buildings in the cities, such as the London Hippodrome. Acrobats performed walking on tightropes, suspended in the air from ropes, slings, and ribbons, and from a new invention: the Trapeze. The Circus came to America in 1792, when John Bill Ricketts established his Circus in Philadelphia, which later performed for George Washington. The first large canvas tent was used in 1825. PT Barnum and William Cameron Coup introduced the Sideshow, and began the use of specially built circus trains to transport the circus from one town to the next. This was also when the first three ring circus was born. All these American additions were copied by European circuses by the turn of the 20th century. The grand scale of the American Circuses made speech and drama less important, and made showy acrobatic and aerial performances much more important. And through most of the 20th Century in America, the High Wire Aerial Arts were dominated by one family: The Flying Wallendas, earlier known as The Great Wallendas. Born in 1902, Karl Wallenda started performing acrobatics in his teens, taught by Louis Weitzman. Later Karl went out on his own and in 1922 started his own act with brother Hermann Wallenda, Joseph Geiger, and his future wife, Helen Kreis. 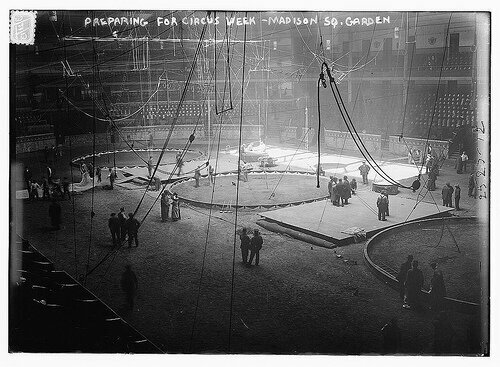 The Wallendas earned early fame by performing on the high wire at Madison Square Garden in New York without a net, since it had been lost in transit. They earned a standing ovation for the performance. Karl performed right up to his death, which occurred at age 73, when he fell from the wire in San Juan, Puerto Rico, during an exhibition. His son, Rick Wallenda, later completed that walk. See video. Karl was not the only famous member of the family. After suffering a bout of cancer that resulted in the loss of her right leg and pieces of both lungs, Angel Wallenda became the first tightrope walker to perform with an artificial leg. Members of the Wallenda Family still perform today. In the latter part of the 1970’s, with some controversy over the cruelty the animal acts exhibited to their charges, animal acts were phased out of many of the circuses, and some countries banned the use of animals in performance. Contemporary Circus, or Nouveau Cirque, uses few, if any, animal acts. The Cirque Du Soleil is one of the more well-known of the contemporary circuses. Nouveau cirque combines traditional acrobatic performance skills and dramatic costuming with theatrical skills and a narrative. Many of the nouveau cirque perform in theaters rather than in tents. Music is often composed specifically for the performance, and is as likely to be punk or rap as it is to be orchestral. The subgenre of cirque noir came into being around the turn of the 21st century, and is geared more towards younger audiences and a more Pop Culture presentation. The emergence of aerialist and cirque performance troupe’s for corporate and private events has solidified the growth of an art form that began some 4000 years ago. This entry was posted on Wednesday, April 28th, 2010 at 8:50 am and is filed under Aerialists History. You can follow any responses to this entry through the RSS 2.0 feed. You can leave a response, or trackback from your own site. this website helped me a lot. Thank you!